Prompt, quality on-site, service & repair, networking, upgrades, sales. Onsite at your location in Longmont, Erie, Boulder and Denver, CO.
Computer Physicians, LLC was founded in 1999 in Longmont, Colorado. We are A+, MCP, MTA certified. Our lead Technician/President has over 15 years experience working with computers. He has many College degrees in Computers. He has a Bachelor degree from Colorado State University in Fort Collins, CO, working with GIS computer systems, and business applications. A degree in Computer Programming at Mercer College, another in Windows Network Support, and Windows Server Administration at Front Range College, Colorado. He is A+ and Microsoft Certified. MCP, MTA, A+. He has worked for Hewlett-Packard providing network and PC troubleshooting, repair and support before starting Computer Physicians, LLC. He has been building, fixing, troubleshooting and repairing PC computers for many years. Computer Physicians, LLC has worked with thousands of satisfied customers since 1999. Computer Physicians provides remote computer help. Just give us a call or text or email us and we will arrange a time to help you with your computer issues remotely through the internet. By using your internet connection we can access your computer temporarily to fix your computer problems. We use a secure connection and once we log off the session is ended and would need a new password to reconnect again.We have found that by using remote access and with you on the other end to deal with moving of equipment or pressing buttons that many problems can be resolved. Many times we can help you the same time you call. We provide on-site, in-shop, and remote computer service. In many cases, we can repair your computer the the day you call us. We also provide remote computer help through the internet or we can come to you so you never have to leave your office. For a reduced rate and quick turn-over time you can visit us at our workshop in Longmont close to 19th and Main. This is about 7 miles from downtown Boulder Colorado. You will need to call us first to let us know what time you will be coming to drop it off, and to get directions. By appointment only. Servicing Boulder, Longmont, Erie, Denver and the Colorado Front Range and worldwide via remote access. Call us for information on pricing or to schedule an appointment. 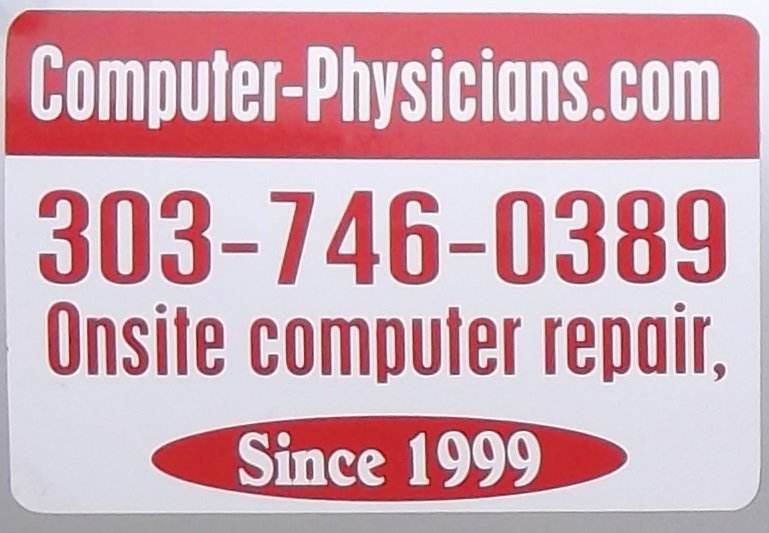 We have used Computer Physicians for over 10 years for our business. The service and expertise in diagnosing computer issues as well as updating our computer systems is superior. Computer Physicians has always had very prompt response service- a big plus to any business with computer issues!! !